In this video we will discuss the differences between snapshot isolation and read committed snapshot isolation in sql server. This is continuation to Parts 75 and 76. Please watch Part 75 and 76 from SQL Server tutorial before proceeding. Update conflicts : Snapshot isolation is vulnerable to update conflicts where as Read Committed Snapshot Isolation is not. When a transaction running under snapshot isolation triess to update data that an another transaction is already updating at the sametime, an update conflict occurs and the transaction terminates and rolls back with an error. Open 2 instances of SQL Server Management studio. From the first window execute Transaction 1 code and from the second window execute Transaction 2 code. Notice that Transaction 2 is blocked until Transaction 1 is completed. When Transaction 1 completes, Transaction 2 raises an update conflict and the transaction terminates and rolls back with an error. Step 3 : Open 2 instances of SQL Server Management studio. 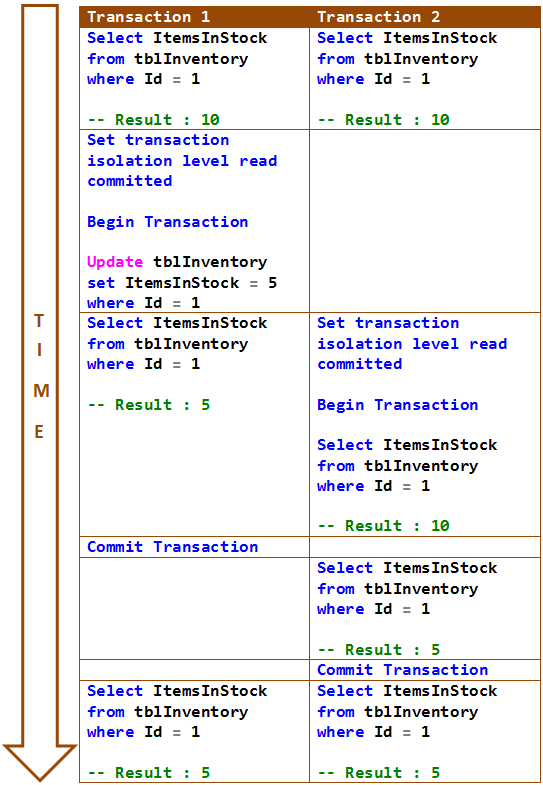 From the first window execute Transaction 1 code and from the second window execute Transaction 2 code. Notice that Transaction 2 is blocked until Transaction 1 is completed. When Transaction 1 completes, Transaction 2 also completes successfully without any update conflict. Existing application : If your application is using the default Read Committed isolation level, you can very easily make the application to use Read Committed Snapshot Isolation without requiring any change to the application at all. All you need to do is turn on READ_COMMITTED_SNAPSHOT option in the database, which will change read committed isolation to use row versioning when reading the committed data. Distributed transactions : Read Committed Snapshot Isolation works with distributed transactions, whereas snapshot isolation does not. Read consistency : Read Committed Snapshot Isolation provides statement-level read consistency where as Snapshot Isolation provides transaction-level read consistency. The following diagrams explain this. Transaction 2 has 2 select statements. Notice that both of these select statements return different data. This is because Read Committed Snapshot Isolation returns the last committed data before the select statement began and not the last committed data before the transaction began. 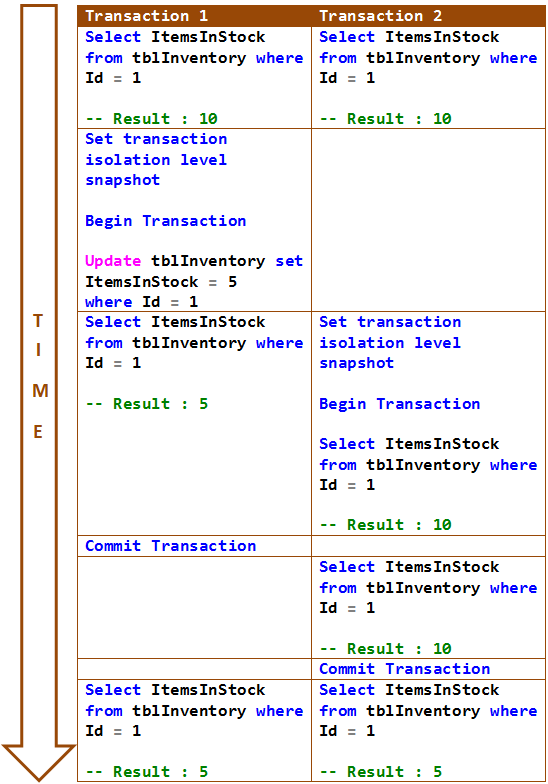 In the following example, both the select statements of Transaction 2 return same data. This is because Snapshot Isolation returns the last committed data before the transaction began and not the last committed data before the select statement began. Sir Please upload a demo of how to deploye asp.net app using hosting account.